I’m a big fan of magazines – they are great for helping the time go by fast at the gym, perfect for lounging by the pool, and of course great sources of inspiration when it comes to anything food related. Somewhere down the line I was put on a subscription list for Family Circle, and sure enough the magazine has been showing up on my doorstep every month. Now since I don’t have kids yet, 90% of the magazine doesn’t apply to me, however they do have some quick and easy recipes that are perfect for whipping up during a busy work week. This is one of them. 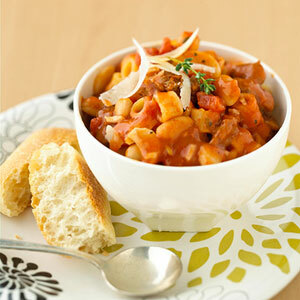 I made this Pasta Fagioli Soup during the week and it got me through a couple of work lunches and easy dinners. It’s low in calories and fat, but full of flavor. Sounds like a winner in my book. 1. Heat oil in a large pot over medium heat. Add onion and cook for 5 minutes. Add garlic, cook an additional 1 minute. 2. Stir in tomatoes, chicken stock and 3 cups water. Bring to a low simmer. Add your pasta (I cooked mine beforehand) and Italian seasoning. Cook for an additional 5-10 minutes. 3. Stir in kale, cook for 5 minutes and reduce heat. Add tomato paste, beansm salt and pepper. Continue to let soup simmer. 4. Serve into bowls and garnish with fresh Parmesan. This entry was posted in Uncategorized on January 16, 2011 by allie@sweetpotatobites.